Melissa at 320 Sycamore is hosting a Favorite Things linky party. If I were to be honest about my favorite things, the majority of my list would consist of sugary food items and Coke Slurpees. I limited myself to one edible favorite thing! My mouth is watering just looking at it. I might have to lick my computer screen. 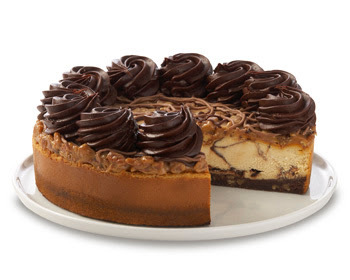 I don't even really like cheesecake, but this is heavenly! It's a really sweet book and would make a great gift. Don't get this for anyone as a gift, but the Swiffer Wet Jet is fabulous! We mainly have wood floors in our house and it works great. And you don't have to run to the sink every 2 minutes to ring out your icky mop. Oscar Blandi hair color pen. I think the name is something more official, but you get the idea. It is great to cover your pesky grays when you don't have time to really color your hair. One of my favorite movies is Elf! It's just so happy and cute and quotable! " I like smiling, smiling's my favorite"
Bath and Body works Mentha lip shine. The colors are great and it smells minty. You don't even have to brush your teeth! Except you totally should brush your teeth. I can't wait to read other people's favorite things. I am sure I will find some new favorite things of my own! Great list. Smiling is my favorite too. I like your list! I love my steam mop too. I kind of would of liked to have seen all of your other sugary treats.. I love your list. You and I would get along great! I have never heard of a hair color pen. Lately, I've been using a much more refined way of covering my stray grays... a black sharpie marker. Maybe I should look for an Oscar of my own. Ha! And Dina I would be totally fine with getting a floor cleaner-I desperately want a shark steam mop! ha! That cheesecake does look yummy and I just saw that book today. I think I'm going to have to check it out! Thanks for sharing! I love the movie ELF! Love him! New follower from linky favorite finds party. Would love a visit. Love your list! The cheesecake, the movie, the book are all fab! Stopping over from 320 Sycamore. Merry Christmas! LOVE that mentha lip shine! I have been wanting to read that book~thanks for the recommendation! Merry Christmas!